← What Causes Brain Fog? Found in virtually all cell membranes, CoQ10 (ubiquinone) is a powerful antioxidant and a vital participant in oxygen utilization and cellular energy production. Synthesized by the body and naturally found in organ meats, cold water fish, whole grains and some vegetables, the highest concentrations of CoQ10 are found in the body’s high energy organs, including the heart, kidneys, pancreas, liver, and the adrenals. CoQ10 acts as a cofactor in the mitochondrial synthesis of adenosine triphosphate (ATP). ATP transports chemical energy within the cells for metabolism and is therefore essential for the health of virtually all tissues and organs. In its significant antioxidant role, CoQ10 helps to reduce and prevent the generation of free radicals, and modifications to proteins, lipids and DNA. In addition to its energy production and antioxidant functions, CoQ10 helps to strengthen the immune system and boost physical performance, as tissues and cells are highly energy- dependent and require a steady supply of CoQ10 for optimal function. 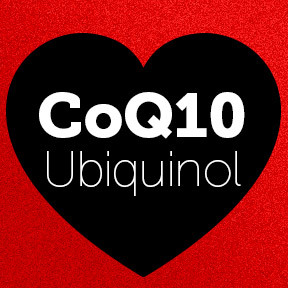 In the body, CoQ10 exists either in its oxidized form, ubiquinone, or in its reduced form, ubiquinol, and has very unique ability to cycle back and forth between the two forms. CoQ10 aids homeostasis by either donating or accepting an electron in the chain of reactions that lead to energy production. When oxidized ubiquinone accepts an electron from another molecule, it becomes ubiquinol. When ubiquinol donates an electron it becomes oxidized ubiquinone, continuing the cycle. The conversion of ubiquinone to ubiquinol is a process that naturally occurs in young, healthy bodies. However, the body’s ability to convert ubiquinone to the more bioavailable antioxidant form of ubiquinol is compromised by aging, certain medications and some chronic disease states. The ability to create CoQ10 begins to decline around 30 years of age. Statin drugs that lower cholesterol are known to impair production of CoQ10 as well, often resulting in side effects such as muscle pain, fatigue and memory loss. Statin drugs may also impair conversion of vitamin K1 to vitamin K2, which is critical for heart heath and other functions. -Cardiovascular health support. CoQ10 helps to maintain optimal heart muscle function, and supports circulatory and vessel wall health. Deficiency of CoQ10 is associated with cardiovascular issues, including arrhythmia, heart failure and high blood pressure. -Support for natural cellular energy production. CoQ10 sparks energy production in every cell, including cells of the heart, the body’s largest energy consumer. Lack of energy that many believe is a normal part of aging may actually result from low levels of CoQ10. Adding this supplement to one’s daily routine may result in higher energy levels over time, as the amount of ubiquinol accumulates and is maintained in plasma, organs and tissues. -Overall health support. By aiding energy production and protecting organ cells from oxidative stress and free radical damage, CoQ10 supports the overall health of all bodily cells, organs, and tissues. -Reduced oxidative stress. Oxygen is an essential element that nourishes cells, and creates energy via cellular respiration and metabolism; processes which result free radical formation. Although beneficial in small amounts, an abundance of free radicals, when not neutralized by antioxidants, can damage DNA, and contribute to diseases and premature aging. -Restored levels of CoQ10 depleted by medications. It has been shown that statin use leads to a decrease not only in cholesterol but also in ubiquinone. The decrease in blood levels of CoQ10 may result in impaired antioxidant protection and therefore lead to oxidative stress. Those with a family history of heart problems, those taking statin medications, or those at increased risk for cardiovascular disease should consider speaking with a healthcare provider regarding ubiquinol supplementation. CoQ10 100 mg by Integrative Therapeutics: This highly rated CoQ10 supplement supplies support for overall wellness, energy production and cardiovascular health. Gluten, wheat, dairy and artificial ingredient free formulation. Coenzyme Q10 by Douglas Laboratories®: One softgel provides 100 mg of CoQ10 as ubiquinone in support of cellular energy production and antioxidant protection. The formula includes 100 IU of vitamin E as d-alpha tocopherol for enhanced absorption. Soy free. Ubiquinol-QH 100 mg by Pure Encapsulations®: This product supplies Kaneka QH™ CoQ10 in its active, readily-absorbable antioxidant form in support of cellular energy production, antioxidant protection, cardiovascular health and physical activity. Gluten free, Non-GMO formulation. Liposomal CoQ10 by Empirical Labs: One serving provides 200 mg of CoQ10 as ubiquinone in highly absorbable liposomal form for enhanced delivery. Non-GMO formulation. This entry was posted in Home and tagged Cardiovascular health support, Coenzyme Q10 by Douglas Laboratories, CoQ10 100 mg by Integrative Therapeutics, CoQ10 and Ubiquinol Health Benefits, Liposomal CoQ10 by Empirical Labs, Overall health support, Reduced oxidative stress, Restored levels of CoQ10 depleted by medications, Support for natural cellular energy production, Ubiquinol-QH 100 mg by Pure Encapsulations. Bookmark the permalink.